This is where we will continue blogging. This old site here will remain, but will not be used for new posts. Moving to a new domain is a lot of work, and so blogging over the next few days will be slow. Fortunately I have a good mate who has taken me through this important step. New new domain will enable many new features and allow readers to easily subscribe using social networks like Facebook, Twitter, RSS and so on. Overall it means better service for all of you. Hope to see you at our new site! Der Spiegel reports here on Russia’s extreme heat that’s has contributed to higher death rates and wildfires, plunging Moscow into a thick, choking smog. Hat-tip to reader DirkH. The following NASA photo shows where it’s hot, and where it’s cool. So far 7600 km² have burned. NASA’s Terra satellite shows that the fires began in later July, when temperatures in the areas were 12°C and more above normal. One sees how the heat is concentrated in one spot, while the remainder of the continental area is near normal or even cool. Russian meteorologists say they are unable to find anything in the archives that compares to this, not in the last 1000 years. Forest fire experts say the authorities also get most of the blame for the catastrophe. Large fires like this one in Russia are caused primarily by man. There is no evidence that the fires ignited by themselves because of the drought. Goldammer says that excessive deforestation of the landscape may be a factor in the fires because they leave barren steppe-like landscapes that tend to dry out quickly and become a tinderbox. But then Goldammer’s makes the dubious claim that this was caused by the fact that the forests had been put into private hands, and then recommends Soviet-style land use! It has something to do with sustainable land use, like land-use in the old Soviet Union, where it was much more efficient than today. Now that’s the way to solve problems. I suggest Goldammer read up on how the Soviets managed to run the entire country into the ground. Are the recent, numerous weather extremes seen worldwide ominous signs of the climate catastrophe? NDR went on to mention the weather anomalies in Moscow, Pakistan, China and the local floods in the eastern part of Germany, and emphasized all the death and destruction along with it (They forgot to mention the severe cold in South America). Fortunately, the data tells the opposite story. Yet anyone taking a closer look will see that all the extraordinary drama is confined to the newsrooms, and is not what’s going on outside. The latest tropical cyclone energy index shows that cyclones are near all-time lows. Where are all the big cyclones we were told would be coming in the wake of Katrina? Nasty weather extremes have always occurred, and there are no statistics to show they’ve picked up. The number of deaths resulting from weather and natural disasters is also declining. There are many factors involved here, but the sky fell more often back then than today. Indeed looking at the top 10 weather catsatrophes in the USA, the worst ones happened long ago. See Live Science here. 7. 1988 Heat Wave, between 5,000 and 10,000 dead. But let’s not focus only on the USA, where statistics are easy to get. Let’s look at other parts of the world. Now here’s a graphic (sorry about the quality) showing cyclone activity in the bay of Bengal and Arabian Sea from 1890 until 2000. Looks downward to me. Here the vertical axis shows the annual frequency of cyclones and the x-axis shows the year. The dark line is the 10-year moving average. And what about deaths globally? With all the bad climate change and growing populations, you’d think people would be getting killed on a massive scale. The following graphic shows the opposite is true. So why do some believe that extreme weather events are occurring more often than ever and that more people are dying and suffering? This is because the media stories have increased dramatically over the years, as they report on every Tiny Tim storm out there as if it were a Cat 5. It’s overhyped. The above graphic shows the number of newspaper reports about climate change, which is often cited as the reason for every weather anomaly happening out there. Fortunately, things on this big blue planet of ours have been quieter weatherwise, and people have caught on with respect to what all the media hype is about. All the commotion is coming from the over-agitated folks in the newrooms. By bitter, I mean much colder than normal. This is a summary of what the experts are saying and what the data are showing. We just got a strong El Nino behind us and now a La Nina is forming in the Pacific and is barreling ahead in full development, see the chart below. It’s got the potential to be a big one, meaning global temperatures will go into a nosedive in the months ahead. Joe Bastardi thinks temperatures will reach levels we saw back when Pinatubo blew its top, and maybe lower. The next chart shows the NWS/NCEP forecast for the fall and winter. Strangely, the German weather services here are predicting a 60% chance the coming winter in Germany will be warmer than normal – which doesn’t agree with what NWS service is forecasting. Europe is projected to be about normal. Note: As Joe Bastardi’s latest video shows, regional forecasts coming out of NOAA are sometimes very very wrong! Take a look at the Arctic in the right side panels above, i.e. December to April. We’re talking deep freeze. That’s quite a difference from the constant red bloodbath we’re used to seeing from GISS and NOAA. The months ahead are going to be really tough for those trying to avoid the Al Gore effect. Average global temps to a great extent will depend on the depth of the La Nina. Look at the following graph and compare this La Nina with the last one back in 2007-08. What do you see? Where were we at this time in 07? Looks to me right around zero. This time around we’re already 1°C below that. Also look at the overall slope in this year’s plummet. This La Nina will seriously depress global temps in the months ahead, thus throwing ice water on the NCDC’s fantasy of the hottest year ever. It’ll be interesting watching them try to pull it off. They need it for Cancun. The poles are also indicating lower temperatures. No death spiral in the Arctic. Zed’s dead, baby. The DMI chart already shows freezing at 80°+N latitude. But it has ticked up a bit. No matter it was the coldest melt season in that area on record – in the “hottest year ever”. Go figure! The Arctic will not set a new record low sea ice minimum this year, as many were hoping, panting and drooling for. It isn’t even going to set the second lowest. A third lowest is still in the works, though the odds are tightening. Total sea ice of the north and south poles is smack normal – and again, this in the “hottest year” on record. Okay, a winter’s forecast is not climate – many will crow. Yes, but weren’t we told that such winters were a thing of the past? To the contrary, more and more we’re hearing they may very well be a thing of the future. Folks, all these nice graphs are available at my Climatic Indicators side bar on my homepage. Take a look and you be the judge. Reading all the climate doom and gloom in the more prominent German online papers like Der Spiegel, Die Welt, the Frankfurter Allgemeine Zeitung, etc., you’d think by now readers would have long since barricaded themselves inside their homes and crawled under their beds in angst, in order to hide from the dreaded Klimakatastrophe. So frequent are the alarmist climate stories. Normally such stories would be better placed in the comics section. But in Germany newspapers don’t have a comics section, and so they get mixed in with the news. Day after day normally respectable papers are filled with worst-case reports, often extracted from press releases dribbled out by tax-payer funded panic-houses like the authoritarian Potsdam Institute for Climate Impact Research. But, hardly anyone believes them anymore: 90% to 10%. Yesterday I read yet another rehashed panic story in Die Welt, whose title translates: Heat Waves Threaten With Increasing Frequency. Very revealing are the reader comments. Judging from them, a majority of German readers scoff at the claims the planet is heating up catastrophically, and do so with a whoppingly huge majority. Wunderbar! Alarmist climate science has lost its credibility, authority and trust, it seems. There’s hope for real climate science after all. Yes, a broad majority of informed Germans, at least Die Welt readers, believe climate science forecasts fundamentally are rubbish. Sure this is not a real survey. But to me it’s a clear signal. Some online papers have even given up allowing readers to have their say, having grown tired of being told their “news” are rubbish. So give Die Welt some credit for allowing readers to have a voice. Interestingly, the Germans have a wide selection of words that mean “nonsense”, and one finds them used regularly in reader comments about climate. Here are some: Unsinn, Bloedsinn, Quatsch, Unfug, Dummheit, and Humbug. Now we can add another to the list of synonyms: Klimawissenschaft (climate science). So now when my son worries about a minor matter, I simply tell him: “Don’t worry, it’s all climate science”. Last week I wrote about a Russian-German temperature reconstruction from 1600 to 2000 derived from tree rings from the Kola Peninsula in northwest Russia . The paper appeared in the journal Arctic, Antarctic, and Alpine Research, Vol. 41, No. 4, 2009, pp. 460–468, by Kononov, Friedrich and Boettger. In response, German media outlets all hollered “RAPIDLY RISING ARCTIC TEMPERATURES!”, focussing solely on one statement that temperatures have been rising since 1990. It’s a classic example of how a scientific study comes up with Result A, but the public ends up understanding Result Z, all thanks to sloppy and incompetent communication that exists between the two. Both graphics show the Little Ice Age from 1650 to 1750, at which point a warming event ensues. 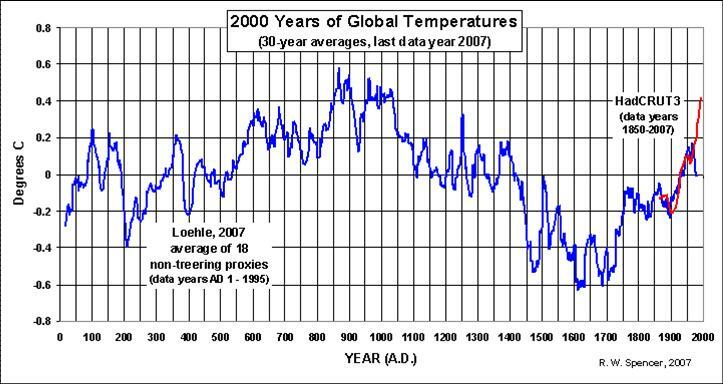 Then it was generally flat from 1750 to about 1920, and then followed by another rise that took place until 1950. Then Kola tree-ring proxies show a cooling up to 1990. Since 1990 warming has occurred again, but it’s a warming that is completely within the natural range of variation. The Kola reconstruction (1) agreed with an earlier reconstruction (2) done in the area, see map below. What’s more, the Kola reconstruction (1) was compared with tree-ring reconstructions from other Arctic regions: Swedish Lapland (3), Yamal (4), and Taimyr (5). The reconstructed summer temperatures of the last four centuries from Lapland and the Kola and Taimyr Peninsulas are similar in that all three data series display a temperature peak in the middle of the twentieth century, followed by a cooling of one or two degrees. Only the Yamal reconstruction differed completely, resembling the shape of a hockey stick with the blade beginning at 1900. The hockey stick is becoming an artefact of activism. Except for the Yamal reconstruction, all tree-ring and non-tree ring reconstructions appear to agree, and so indicate no correlation between temperature and atmospheric CO2 concentration. We found that over the whole investigated period fluctuations of summer air temperature reconstructed for the Khibiny Mountains in the central part of the Kola Peninsula have a good consistency (r >0.50) with changes of solar radiation (Fig. 10), especially for the low-frequency signal. The broad similarity between this temperature construction and solar radiation indicates that solar activity is an important driver of centennial to multi-decadal trends in summer temperatures of the Kola Peninsula. So why did all media reports holler “RAPID TEMPERATURE INCREASE IN THE ARCTIC”. Call it complete communication incompetence by the media players between science and the public. The Kola reconstructions show no link to atmospheric CO2 concentrations. It all started with a solid scientific paper, and but then was distorted (purposely?) by a vague press release that culminated in alarmist media headlines. Let’s call that press release incompetence-gate.